Joos van Cleve was a Netherlandish painter active in the first half of the 16th century whose work to some extent reflects the influence of Italian art although it is primarily based on Flemish models. In the present panel Van Cleve depicts a theme that would subsequently become extremely popular in the 17th century. 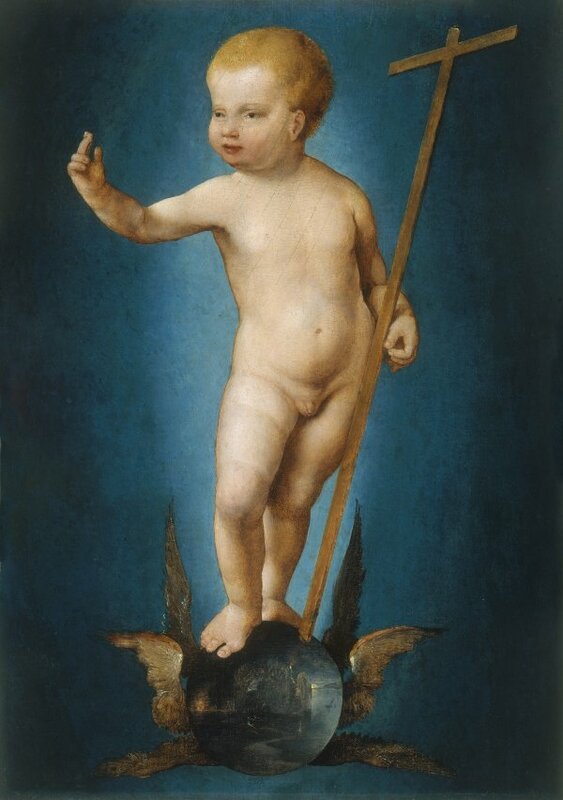 He shows the Christ Child in the foreground, posed in a sophisticated contrapposto and standing on the orb of the world, holding a cross in one hand and blessing with the other. The image evokes the idea of the Passion of Christ and that of the Christ Child as Saviour of mankind. Iconographically, it is inspired by classical culture, with Cupid with a sphere here referring to the love of Christ. In addition, it relates to images of Fortune, who generally has a ball at her feet symbolising instability. Italian influence is again evident in the slight sfumato of the figures derived from Leonardo da Vinci, while there are also allusions to Flemish painting in the landscape on the sphere that suggests Netherlandish artists such as Joachim Patinir. This small painting was possibly intended for private devotional purposes. Van Cleve depicts an iconographic theme that was widespread during the Counterreformation and the 17th century and was particularly popular in Spain where it was depicted in both painting and sculpture. 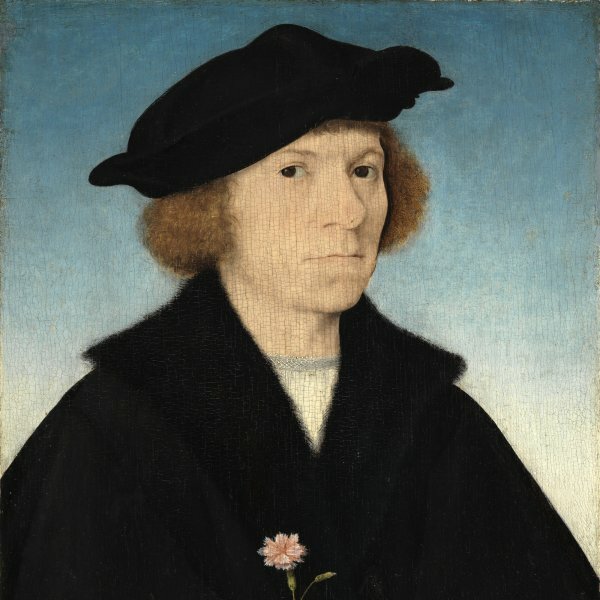 This example has been dated to around 1530 to the last decade of the artist’s life and thus corresponds to his mature period. During these years Cleve lived at the court of François I in France, probably from 1528 to 1535 when his name disappears from the city records in Antwerp. His activities as a portraitist at the French court are known from his images of the French monarch and his wife, Leonor of Austria. During this period his style evolved towards more elongated figures, his colour range became more earthy and his handling more precise and highly finished. He was also influenced by Leonardo’s technique of sfumato, to be seen in a number of his oil paintings. It is possible that Van Cleve visited Italy during the time that he was away from Antwerp. 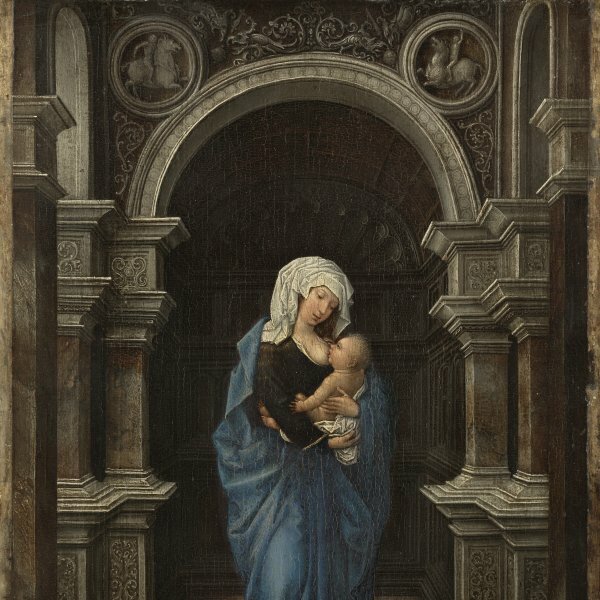 In this image the artist combined Italian and Flemish elements. The Child, depicted full-length in elegant contrapposto on a crystal sphere, holds a slim cross in one hand and blesses with the other. His body maintains a delicate balance on the sphere but his legs and feet are securely positioned. The antecedents for such a figure are to be found in Italian art, while the landscape in the sphere with its four wings is Flemish in origin. Images of this type, which became popular in the 17th century, combine the mood of the Christ Child’s happy infancy with references to his future sacrifice with the intention of moving the viewer and thus encouraging religious meditation. Images involving this concept included pleasing depictions of the Infant Christ asleep on the cross, holding a small cross, or crushing a serpent under his feet. The same message had previously been expressed in art through the symbolism of grapes, relating to the Eucharist, red carnations or pinks, referring to the Passion, and fruit such as an apple, alluding to Christ as Redeemer. The development of this iconography may have looked to images from the classical world, for example, depictions of the figure of Fortune with a globe of the world at her feet as a symbol of the uncertainty of life, as well as images of Cupid (perhaps closer to the present concept) holding a sphere in reference to the universality of love, although this is not particularly common. More generally, the sphere as a symbol of the universe was also used in depictions of monarchs to express the idea of earthly power, and in religious art to symbolise the world. In the present work the message is clear, presenting Christ as the saviour of Mankind. 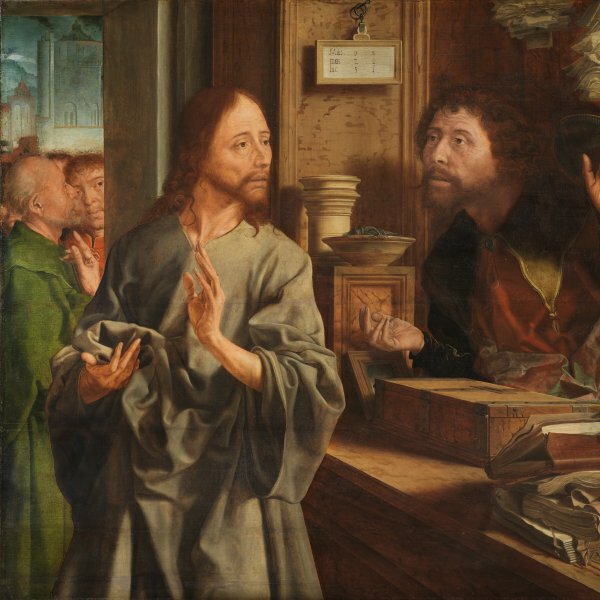 The panel entered the Thyssen-Bornemisza collection in 1975 from the Dutch art market. The oldest known reference to the painting dates from 1927 when it was with the Berlin dealer Julius Böhler.